Represents a reference to a non-type template parameter pack that has been substituted with a non-template argument pack. 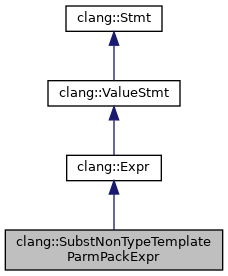 When a pack expansion in the source code contains multiple parameter packs and those parameter packs correspond to different levels of template parameter lists, this node is used to represent a non-type template parameter pack from an outer level, which has already had its argument pack substituted but that still lives within a pack expansion that itself could not be instantiated. When actually performing a substitution into that pack expansion (e.g., when all template parameters have corresponding arguments), this type will be replaced with the appropriate underlying expression at the current pack substitution index. Definition at line 4159 of file ExprCXX.h. Definition at line 1522 of file ExprCXX.cpp. Definition at line 4204 of file ExprCXX.h. Definition at line 4208 of file ExprCXX.h. Definition at line 4199 of file ExprCXX.h. Retrieve the template argument pack containing the substituted template arguments. Definition at line 1532 of file ExprCXX.cpp. References clang::Expr::Expr(), clang::OK_Ordinary, and clang::VK_LValue. Definition at line 4196 of file ExprCXX.h. Definition at line 4197 of file ExprCXX.h. Retrieve the non-type template parameter pack being substituted. Definition at line 4187 of file ExprCXX.h. Retrieve the location of the parameter pack name. Definition at line 4190 of file ExprCXX.h. Definition at line 4160 of file ExprCXX.h. Definition at line 4161 of file ExprCXX.h.